This holds true for marketing as well. 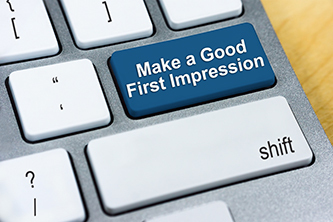 Here, we’ll look at the importance of first impressions in digital marketing. Unless the prospect knows your organization’s URL or enters your organization’s name directly into a search engine, chances are the first online impression will be a banner ad or search ad. It’s not only the ad itself that will impact that first impression, but how that ad is served up and who sees it. Who sees your ads depends on how you target your audience. For example, you can target your audience via different demographics. Want to attract a diverse audience? Serve up ads, with appropriate imagery and messaging, to women and minorities. Want to drive traffic to a brick-and-mortar location? Target your audience geographically. Looking to hire someone with X years of experience? Target your audience by age. Why bother targeting, you ask? Why not try to reach the largest possible audience? When you target, you will attract quality leads. You also will be delivering relevant content to viewers. Digital marketing is both an art and a science. If you’re doing it right, when prospects click on a banner or search ad, they won’t go to the home page of your website. Instead, they’ll be taken to a carefully crafted landing page. You should have a separate landing page for each ad campaign. That way, there won’t be a disconnect between the ad and your site. Again, think relevant content. Make that your marketing mantra. Keep in mind that the landing page cannot — and should not — include every single aspect of your product or service. It should include just enough information to pique the prospect’s interest. A key component of your landing page is the form capturing prospect data. To minimize distraction and encourage form completion, your landing page should have no other outbound links besides the form itself. You need enough form fields to capture data but not so many that the prospect is overwhelmed. A lengthy form can create an unfavorable first impression among prospects. And a strong call to action (CTA) will boost form completions. For those who do go directly to your website by entering the URL or searching for you by name, your home page will make the all-important first impression. You want an attractive home page, but you shouldn’t sacrifice content for aesthetics. Make your site “sticky”; that is, include content and links that will keep visitors on your site longer. Your entire website should include keywords that you (and your competitors) are bidding on in search marketing campaigns. If you’re not sure what keywords to use, free online tools such as Wordtracker can help you get started. Timing is everything. Your sales cycle may or may not coincide with the buying pattern of prospects. There certainly will be overlap, such as at Christmastime for a gift retailer, but this will vary among your prospects. That’s why you should schedule ads throughout the calendar year. And that’s why you should constantly refresh your creative. If you have outdated ads, that first impression won’t be a positive one. The first impression is just the first step in terms of marketing. While first impressions are important, it’s the continuing dialogue with your prospects and customers that will build your brand — and your business.